building opened in 1998. 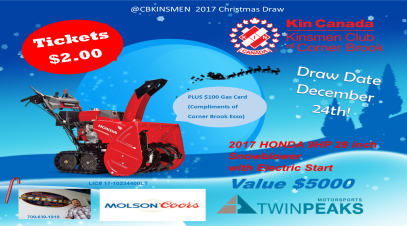 Profits from the Canteen are split between @CBKinsmen and the Corner Brook Civic Centre. Since the Early 90's, We have operated Prince Edward Campground & RV Park. When we took over Park operation, the Park was costing the town more than $25,000 to operate. For the first 20 years, we re-invested all profits back into Park Development. We have achieved all the original goals set out by our Club. Sustainability, Family oriented, Tourist excessible and affordable. Teams of 4 participate in a Best Ball Tournament for Fun, Prizes and to support our many co-sponsors. In 2018 we held our first " Beer for a Year" Draw for Fathers Day. Tickets are Just $2 and you could win 52 weeks woth of Molson!
" A Night at the Races". 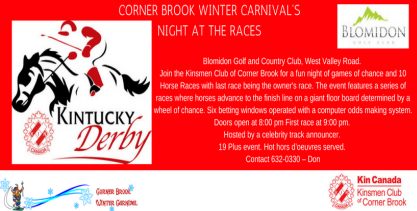 Held at Blomidon Golf Club, The 19+ event is crowd pleaser during the many festivites of Winter Carnival.
" Winter Carnival Variety Show". Held at Corner Brook Arts and Culture Centre, this event is offers a showcase of Local Talent, A full house every year!